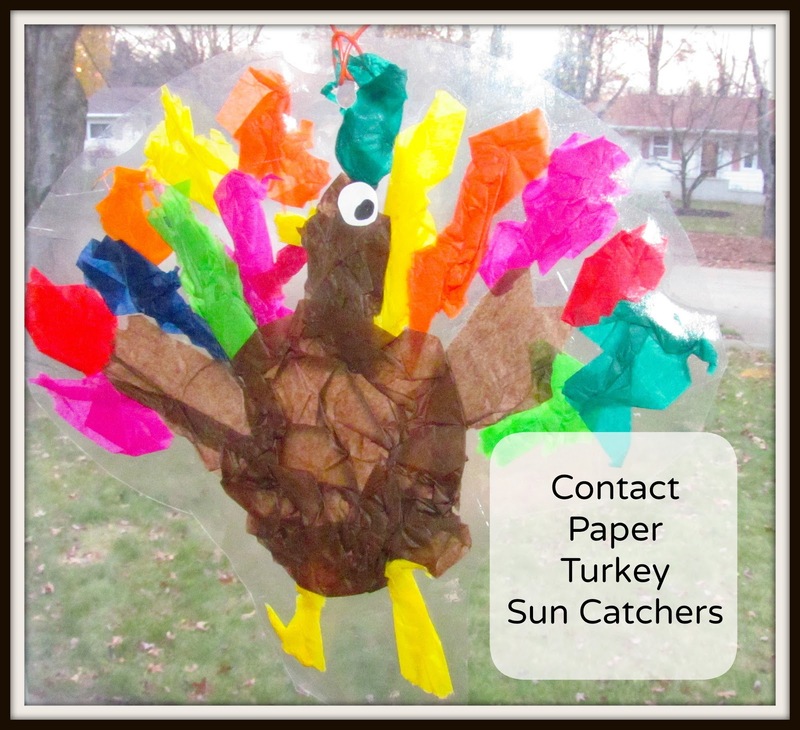 We created Contact Paper Turkey Sun Catchers after realizing our dreary windows needed cheering up for the upcoming Thanksgiving holiday. Thanksgiving seems to get left out and I began brainstorming for some crafty ideas to make including this one. Some of my beat ideas seem to come from these moments. Keep reading to find out how we made our Turkey Sun Catchers. First peel back the non-sticky layer of contact paper to reveal the sticky sheet side up. Then start placing torn and crinkled sheets of tissue paper down on to the sticky contact paper. We began with the brown turkey body, head, and wings. Then added details on the head and add the feet. Add colorful tissue paper for the feathers. Then place the non-sticky layer of contact paper on top of the sticky and tissue paper layer. Press down. Trim around the picture or turkey. Add string or wire to hang. Let the line shine through your creations for an upcoming Thanksgiving sunny day! This is a turkey without trimming.